To all those fighting for dignity and against displacement & rezoning. An Encuentro is a space for people to come together; it is a gathering. An Encuentro is not a meeting, a panel or a conference; it is a way of sharing as another form of doing politics: from below and to the left. It is a place where we can all speak, we will all listen, and we can all learn. It is a place where we can share the many different struggles that make us one. We are here. We are a community in resistance. We feel a new moment. Around the city, the country, and the globe, the system is heaving and shaking. We see it showing thin cracks in its concrete walls. Here in the city, we see dignified people coming together in opposition to racist policies that threaten to displace us – low-income tenants, the homeless, small businesses – from our homes and communities. The Mayor, backed by real estate and large corporate interests, attempts to strengthen his grip on the reins of power, by designing, promoting, and approving racist policies such as rezoning and luxury housing plans that displace our communities. Those from above seek to sell off public housing by privatizing and annexing the land where the city’s poor live. The powerful target and criminalize our marginalized homeless sisters and brothers through brutality and harassment. Politicians, at the service of corporate interests, and real estate developers belong to a culture that uses the power of money to take control of that which belongs to our communities. They want to remove the street vendors, who earn an honorable and dignified living, the families that have their small restaurants, small clothing stores, and the small bodegas on the corners in our neighborhoods. They want to displace us to bring in their luxury restaurants, their large expensive clothing stores, and their supermarket chains. They want to change our neighborhoods. The powerful want to change our culture using their oppressive plans. They want to change that which makes us Latin@, Black, Asian and/or Indigenous. They want to destroy everything that makes us vibrant communities of color and replace us with their culture of money. We know that these imposed oppressive plans cannot be reformed or revised to work in service of the people. Local politicians use their power, influence and money to try to buy off resistance in our communities and pacify dissent under the guise of “community engagement,” to make their racist rezoning plans more palatable and “acceptable” and there are those that choose to accept the money of the powerful and ride on the currents of their power. They want to create illusions on the side of the powerless and benefit from the powerful. Power seeks to divide and marginalize us as people of color, as women, as transgender, lesbian and gay, as youth, as the elderly, as workers, as the homeless, as immigrants, as tenants. We must resist division. We must seek to come together. As we struggle here, we do not forget our sisters and brothers resisting in the far corners of the world. Nor do we forget where we come from and that many of us have already experienced displacement from our homelands. We join the humble and simple people across the world in their resistance as we stand up and join the fight against those from above who have pushed us to this dignified rage. So once again we invite to our corner of the world those who are struggling for housing, for freedom, for justice, for love, for a voice, for a space to exist, for the preservation of our communities, for peace, for respect, for themselves, for their community, for dignity…for humanity. Groups fighting for humanity & against displacement across New York, the country and the globe will share our struggles and use this gathering to find ways to mutually support each other. We will share whatever form of expression we choose, whether it be verbally, through song, poetry or rhyme, through artwork or however people can best express their struggle. P.S. Children are especially invited to come break open the “REZONING = DISPLACEMENT” Piñata! We will provide childcare and Spanish/English translation. Please RSVP by January 20th with the number of adults and children that will be attending, their names and an address at which you would like to receive your tickets. Once you have sent an RSVP you will receive your tickets and more details on the Encuentro. Movement for Justice in El Barrio is an immigrant women- and people of color-led, grassroots community organization in East Harlem that fights for dignity and against displacement. For eleven years, Movement has built a local movement for dignity that has taken on and defeated multi-national corporations and corrupt politicians. Committed to the principles of autonomy and self-determination, Movement practices participatory democracy and horizontal decision-making on a community-wide scale. Movement fights for the liberation of women, people of color, transgender people, lesbians and gays, immigrants and poor people. We ask for your support in circulating this communiqué in solidarity with the ejido Tila. At the moment our organization is operating a roadblock to demand respect for our rights as Tseltal people from San Sebastián Bachajón and respect for the Chol compañeros and compañeras from the ejido Tila. Compañeros and compañeras, through this communication we would like to say to our compañeros from the ejido Tila that they are not alone because we join their struggle; our community raises its voice in solidarity with the ejido Tila, which is now experiencing a time of repression and harassment from the bad government which has a habit of attacking, killing and disappearing those who defend the land; the women and men of San Sebastián Bachajón raise their hands to support our compañeros from the ejido Tila, we call upon them to unite their strength and finish with this injustice; we as humble people of good heart defend and support those who defend the natural resources of our territory, we fight every day for the good of our children and grandchildren in the future; this is why the bad government pays paramilitaries to seek to divide us, and sends them to assassinate, disappear or take the land defenders to prison in order to intimidate us so they can take away our lands; we will say that we are ready to fight against the politics of the bad government, so the ejido Tila can hear in our voice that they are not alone, their fight is our fight and we stand ready to support our compañeros, that our organization is ready to support and defend the struggle, because that way they will not be afraid of the bad government and its repression, its imprisonment and its death, because the Mother Earth is all our people and we are ready to defend her at any cost. We greet the indigenous community of Ostula and celebrate the freedom of compañero commander Semei Verdia. We demand the immediate release of Esteban Gómez Jiménez, prisoner in Cintalapa de Figueroa, Chiapas (amate #14) Santiago Moreno Pérez and Emilio Jiménez Gómez, prisoners in Playas de Catazajá, Chiapas (cereso #17) who were imprisoned for having the commitment to fight and defend the mother earth, as we also demand the freedom of other political prisoners of Mexico and the world. The communal lands in Chiapas’ community of Tila have long been threatened by authorities’ attempts to arbitrarily expropriate and privatize the land. Members of the small town of Tila in the southern Mexican state of Chiapas have accused municipal authorities of harassing local residents as part of a plan to rob more than 320 acres of the communal land from the community, the Mexican daily La Jornada reported Tuesday. According to community representatives, Tila residents have suffered attempted land grabs for decades as municipal officials have tried to convert the collectively-owned indigenous territories into private land to be bought and sold, La Jornada reported. Community activists in the local Tila Ejido Supporters of the Sixth Declaration of the Lacandon Jungle, a Zapatista declaration of revolutionary movements’ vision for Mexico, have already slammed municipal officials for abusing their power to repress and control indigenous communities. In a recent statement, activists accused Edgar Leopoldo Gomez, president of the Tila municipality, of supporting the resurgence of the Peace and Justice paramilitary group, which was responsible for killing 122 indigenous people and displacing 4,000 between 1995 and 2000. Tila residents also marched earlier this month to protest municipal officials after many activists received threats and suffered other arbitrary action by authorities. Agressions against the community have included an incident of security forces opening fire on local residents on Dec. 20, injuring several people. Police shot at a Ch’ol Indigenous resident (Dec. 20) in Tila, Chiapas after recording him. Community members say that paramilitary presence that all but disappeared in the area has resurfaced in recent months in the form of roadblocks that harass residents. In the face of such threats and suspicions that local politicians are deliberately acting against the community, Tila residents have taken action to try to expel municipal officials, including municipal President Gomez, La Jornada reported. Community members say they simply want to live in peace, free to make their decisions using their own customary methods free of harassment from authorities. The Peace and Justice paramilitary group, accused of being supported by local government, is responsible for killing 122 and displacing 4,000 in Chiapas. A Mexican paramilitary group that killed or forcibly disappeared 122 indigenous people between 1995 and 2000 is on the rise again in the southern state of Chiapas with suspected links to local politicians, the Mexican daily La Jornada reported Monday. In a statement, activists in Chiapas accused Edgar Leopoldo Gomez, president of the Tila municipality, of supporting “in his service” the resurgence of the Peace and Justice paramilitary group with the goal of “controlling” local indigenous residents. 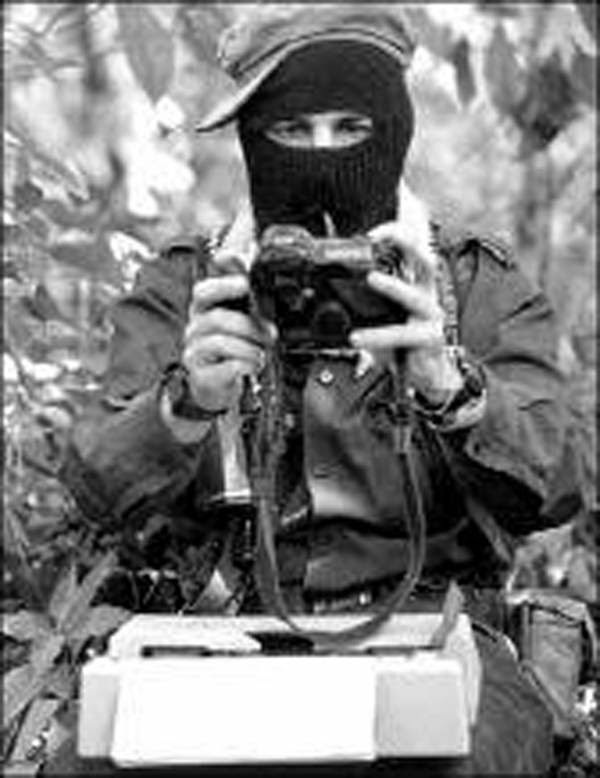 The statement was issued by the Tila Ejido Supporters of the Sixth Declaration of the Lacandon Jungle, a Zapatista declaration of revolutionary movements’ vision for Mexico. The group also accused other Tila municipal officials of supporting the rise in paramilitary activity. Aside from being behind the deaths or disappearances of over 120 indigenous people, the Peace and Justice paramilitary group also has forcibly displaced some 4,000 Ch’ol and Tzeltal indigenous residents in northern Chiapas. According to the activists’ statement, paramilitary perpetrators of historical human rights abuses have long enjoyed impunity for their crimes. The group accused municipal officials of wanting to bring back the “blood and fire” of paramilitary activity in support of local officials’ interests and of using municipal communication resources to organize the Peace and Justice group. The accusations come after Tila residents marched earlier this month to protest municipal officials after many activists received threats and suffered arbitrary action by authorities, La Jornada reported. The statement also comes after hundreds of indigenous people held a demonstration last week in the small Chiapas village of Acteal to mark the 18th anniversary of the slaughter of 45 people including pregnant women and children. Activists and survivors have labelled the massacre a “state-sanctioned crime” and accused the government of supporting the paramilitary group behind the attack. 18 years ago, death came to Acteal. According to the local human rights organization known as Frayba, which focuses on the rights of Indigenous communities in Chiapas, paramilitary violence toward indigenous people in the region has been part of low-scale warfare between the Mexican military and the EZLN or Zapatista resistance movement. Tila residents fear an armed paramilitary attack against their community, according to the activists’ statement. The group accused different levels of government in Mexico of “hiding behind” paramilitary groups that carry out their dirty work. Tila residents also called upon all social organizations to be watchful for what could happen in Chiapas in the face of the paramilitary resurgence. Indigenous peoples protest climate change in Paris. In Mexico, the moral degradation, cynicism and corruption of the political classes became more and more evident, while the combined violence of legal and illegal forces continuously increased. Thus, a structure was consolidated that inside and outside the institutions seeks to subject the population to control and smother resistances and rebellions, inside of an undeclared state of exception. Something similar, with very different degrees and modalities, occurs in the world. In the face of the political changes in Argentina or Venezuela, the persistent Brazilian political crisis, or events in Greece or France, betrayals, errors or weaknesses of the “lefts” are denounced or it warns about restorations or assaults on power from the “rights.” It characterizes what occurred as a setback of popular forces and a rise of capital, of its state administrators and the social sectors that support them. Trump would confirm this interpretation: millions of Americans support positions that even The New York Times classifies as fascist, at the same time that, in the United States and Europe, social behaviours that clearly have that character multiply. Just as 12 million Germans voted for Hitler in 1932 and 17 million in 1933, the media and other factors would be leading large groups to support governments and politicians of the “right,” even against their own interests. Thus the popular forces would be turned back and the neoliberal constellation would continue winning. The Paris Agreement can be useful for illustrating what occurs and for trying to explain it. The conference that produced it was the result of the prolonged public demand to confront climate change. What they signed wasn’t good; the governments publicly proclaimed its merits and many applauded it without reservation, but it was rather a deceptive farce. Grain, for example, which represents a very qualified and respected opinion, pointed out that the agreement it not legally binding in the goal of reducing emissions, does not advance de-carbonization, it supports the industrial agricultural model, the generator of 50 percent of the emissions and protects that these will continue by means of actions that supposedly compensate them. The most serious is that, under the excuse of carbon “seizure,” it will now be openly supportive of geo-engineering, which for many is the principal cause of climate change. Grain, as well as a good part of the demonstrators present in Paris, emphasized that what’s important is changing the “system,” not the climate. Since we’re talking about that, it doesn’t seem reasonable to ask it of the very same “system,” ensnared as it is in a destructive logic that it cannot stop by itself. As is continuously denounced, it’s killing the hen with the golden eggs and rapidly undermining its own basis for existence. The problem is that its suicidal behaviour increasingly puts at risk the survival of the human species and life on the planet and can only be instrumented with a growing authoritarianism. First, an immense global effort was exerted to hold the conference, and later to make the decisions that are lacking. Does that make sense? Why continue trusting in the superstition that those governments and institutions are going to make decisions contrary to the interests of those who control them, that 1 percent that Occupy Wall Street denounced? That would be the year’s principal lesson, which we are far from having learned. Awareness is more general all the time that the current predicaments cannot be overcome inside the framework of ideas, policies and practices that they produce; in other words, inside the current “system.” It’s not enough to change policies or modify the ideological composition of those who are in charge of the institutions. Nor is it sufficient to reform them. It’s illusory and superstitious to continue hoping that the “system” will correct itself, with the same or other leaders, as Paris and all the other cases prove. Therefore, we need to withdraw our trust from the same representation regimen and its electoral dispositive. We also need to withdraw from mere social mobilization, if it is only capable of producing the replacement of leaders, as the result of the Arab Spring demonstrated or of inducing marginal changes in the orientation of policies, as is proven everywhere and was proven in Paris. At this point, the atrocious year allows a crack of hope. It’s underway everywhere, a reorganization from below that step by step transforms resistance into emancipation. The need for the apparatuses of capital and the market is dismantled and for its state administrators and new social relations are forged. Little by little, devices capable of stopping the dominant horror are established, so that the organized people themselves, not their representatives, leaders or delegates, realize the changes that are lacking. It’s not about another superstition or about mere utopias. It begins to be reality. In a bulletin published on 18 December, the Fray Bartolomé de Las Casas Centre for Human Rights (CDHFBC) reported on the arbitrary kidnapping and lack of due process during the arrest of José Alfonso Cruz Espinosa, a support-base for the Zapatista Army of National Liberation (BAEZLN). Since December 2012, the Good-Government Council “The Path of the Future”at La Garrucha (Caracol III, “Resistance for a New Dawn”), which administers the region to which Cruz Espinosa belongs, denounced the fabrication of charges against his person. According to the CDHFBC, the BAEZLN was arrested on 10 November 2015 in Ocosingo by “police dressed in civilian clothes who did not identify themselves, specify the reason for arrest, or even show an arrest-order. They simply put him on a truck and transferred him to the command centre of the specialized police in the centre of the municipality.” After being incarcerated in the State Centre for the Social Reinsertion of the Sentenced no. 16, El Encino (CERSS no. 16), he was transferred via helicopter the next day to the State Centre for the Social Reinsertion of the Sentenced no. 14, El Amate. The CDHFBC reported moreover that “at all times we were denied access to the detainee and our credentials as his counsel were also rejected. The State argued that he had already been transferred, which was untrue.” The CDHFBC added that “the charges placed against him are ecocide and looting due to the events that took place on 16 November 2012 […]. However, José Alfonso was not at the place of the incidents that took place that day.” The Centre stressed as well that Cruz Espinoza was placed at the disposition of those judged for serious crimes, this despite the fact that none of the charges against him are serious. Bail was set for him at 136,122.96 pesos for both charges, being “an excessive amount that prevents bail from being posted,” as the CDHFBC noted. On 20 November, he was released with caution after bail was posted, such that the process in his case will continue. Nine municipalities of the Sierra Madre and the Soconusco in Chiapas state have ratified the declaration that their lands have been freed of mining operations and dams. Using the III Declaration of Tapachula for Lands Freed of Dams and Mining in the Sierra Madre and Llanura Costera of Chiapas, some 40 indigenous and campesino ejidos, communities, and social organizations reaffirmed their commitment (adopted in 2013) to the defence of their territories against plundering as carried out by transnational corporations. The municipalities of Tuzantan, Huehuetan, Motozintla, Tapachula, Escuintla, Acacoyagua, Chicomuselo, and Comalapa denounced the collusion of municipal and state governments with the companies to obtain permits for the exploitation of lands and rivers. They also rejected the models of development, water management, and energy policy that have been imposed in Mexico by structural reforms, particularly the energy reform. “In light of the opposition against extractive projects on our lands, we propose to organize and link ourselves with other struggles that seek to defend their rights and the natural resources of water and land.” In this way, the representatives of the municipalities affirmed that they have ties with other movements, especially in Jalisco, Nayarit, Puebla, Oaxaca, Guerrero, and Veracruz. These are alliances with other struggles over the right to decide what happens on their lands, in favour of living well and strengthening oneself amidst the repression meted out toward defenders of the Earth. In a press-conference which involved the participation of the displaced, the Fray Bartolomé de Las Casas Centre for Human Rights (CDHFBC) indicated that “the Mexican State is responsible for the forcible disappearance of Alonso due to its omissions and its complicity with the perpetrators. According to testimony from the family, they had presented denunciations before the appropriate authorities due to death-threats, harassment, plundering, physical attacks, and denial of the right to education, without an adequate response from the governmental institutions, thus allowing the perpetrators to feel they were protected, in turn leading to further human-rights violations.” The CDHFBC indicated as well that there has been no “search and corresponding investigations that conform with the basic standards of judicial investigation, such that impunity and complicity with the attackers dominates […].” The CDHFBC added that the only person who had been arrested in the case, Alonso Guzmán López, was released in October 2013.